Talk about U.S. manufacturing’s demise or decline is just fake news. “The United States makes stuff. We don’t give ourselves credit for that and there’s this false perception that we’re in the sunset of manufacturing. Not at all. It’s core to what we do,” says Pete Zelinski, editor-in-chief of Gardner Business Media’s Modern Machine Shop and Additive Manufacturing. 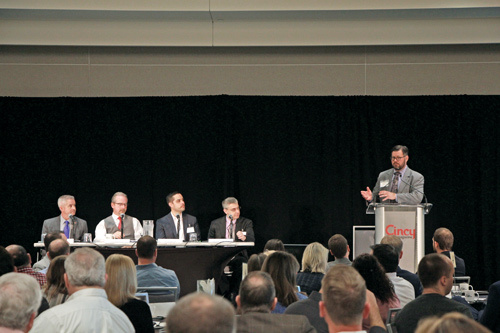 He and other industry panelists at the inaugural Ohio Manufacturing Summit presented by Ohio Business and Cincy magazines, attended by nearly 200 executives in May, offered an upbeat assessment of the industry’s opportunities and challenges. 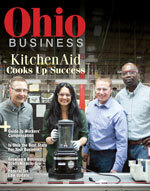 Underscoring manufacturing’s impact, moderator Eric Harmon, publisher of Ohio Business and Cincy magazines, cited industry data that every dollar spent in manufacturing multiplies to $1.81 in the local economy where it occurs, higher than any other industry. Ohio is at the center of it all when it comes to U.S. manufacturing, says panelist Greg Knox, president of Knox Machinery in Franklin and Tri-State Tooling & Manufacturing Association board member. Panelist Dan Janka, president of machine tool builder Mazak Corp., points out manufacturing represents $2.5 trillion to the U.S. economy and employs more than 12.7 million people. “I’ve been in manufacturing for 33 years and I can honestly say there’s never been a better time in the industry than right now,” he says. With that opportunity comes challenges, chiefly finding new skilled workers to replace aging baby boomers. “We as an industry and society have created a 30-year vacuum in terms of the next generation to come along to replace retiring baby boomers. It’s created tremendous challenges for workforce development,” Janka says. “I can’t tell you how difficult it’s been to get young kids interested. Parents and school counselors don’t talk about or promote manufacturing,” he says. But in response to a question, Janka rejected the idea that the skilled worker challenge will limit manufacturing’s future growth. In addition to skilled workers, business has to invest in new technology and manufacturing processes to be globally competitive, he says. 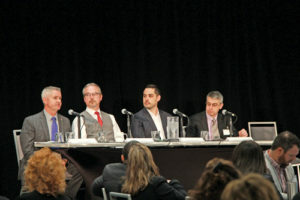 Technology, in the end, may hold the key to the skills crisis, panelists suggested, from new, inexpensive and effective robotics to game-changing innovations such as additive manufacturing, the process of building objects from the ground up one layer at a time rather than the traditional process of cutting material away to craft an item. “Additive, in our opinion, is the next industrial revolution. We’re seeing it displacing many traditional types of manufacturing,’’ says Josh Mook, the final panelist and an engineering leader in additive manufacturing at GE Aviation in Evendale. GE has invested billions of dollars in the new technology, he says. “It’s a big commitment but we believe it will revolutionize the way things are made and designed,” he says. It’s also changing GE’s worker profile. Zelinski suggested that the growing interest in hands-on education, such as the “maker movement” and increasing availability of 3-D printing technology present a new avenue to introduce manufacturing to the next generation. “3-D printers are manufacturing technology. It’s inherently safe and inexpensive and provides a way into skilled and advanced manufacturing that wasn’t available before,” he says. Design/build is a process that focuses on meeting a client’s performance needs rather than minimum design standards. By integrating planning and design and construction responsibilities, EGC can share technical details and ideas generated during the planning and design phases with construction personnel—and implement them with much greater efficiency. Located in Newport, Kentucky, EGC is a privately owned company in business since December 1978. egcconst.com. Commerce Bancshares Inc., through its subsidiary Commerce Bank, operates as a super community bank offering an array of financial products delivered with personal customer service. Commerce provides a diversified line of financial solutions to individuals and businesses. Commerce celebrated its 150th anniversary in 2015, and was ranked among the top 10 on Forbes’ list of America’s Best Banks for six consecutive years. commercebank.com. Founded in 1946, VonLehman is a forward-thinking CPA and business advisory firm that guides closely held businesses, nonprofits and governmental entities through the rough terrain of an ever-changing world. With offices in Fort Wright, Cincinnati and Indianapolis, the firm is one of the largest private CPA and advisory firms in the region. VonLehman goes beyond accounting, tax and auditing services to offer strategic business advice. vlcpa.com. TechSolve is a nationally recognized provider and Ohio’s leader in process improvement expertise across four major industry sectors: manufacturing, advanced machining, aerospace and defense, and health care. The nonprofit’s proven approach aims at eliminating extraneous costs, increasing productivity and maximizing profits. Comprised of business specialists, engineers and scientists, TechSolve’s experts work with a wide spectrum of organizations to help identify and execute custom-tailored solutions. techsolve.org. The Great Oaks Career Campuses (comprised of Diamond, Laurel, Live and Scarlet Oaks) are one of the largest career and technical education districts in the United States. It has been providing career development, workforce development and economic development services to individuals, business, industry, labor, communities and other organizations in southwest Ohio since 1970. greatoaks.com. Centre Park of West Chester is a new event and banquet facility off Interstate 75 across from IKEA featuring a wedding chapel, a 130-room Holiday Inn and restaurant and bar. The multifunctional chapel features accents for any ceremony or event. It opens to a garden area for a ceremony, cocktail hour or reception. The property has an indoor pool and fitness facility, and the ballroom can accommodate 650 people for any type of event. centreparkofwestchester.com. Since 1982, ITA has been providing best-in-class audio-visual services and integrated technology to Fortune 1000 companies, universities, health care institutions, small businesses, hotels and meeting facilities. ita.com. The Tri-State Tooling & Manufacturing Association was founded in 1947 and serves the precision custom machining industry in Southwestern Ohio, Northern Kentucky and Southeastern Indiana. TTMA members are privately owned and operated businesses that are part of an industry generating annual sales in excess of $40 billion. TTMA members design and manufacture special tools, dies, molds, jigs, fixtures, gauges, special machines and precision machined parts for a large variety of industries. toolingandmanufacturing.com.